Our Northwoods location’s address is 18160 San Pedro Ave. Suite 100, San Antonio, TX 78232. This location is in Northwoods Shopping Center, in an affluent area of San Antonio. The Northwoods center is on the frontage road of 1604, so it has great visibility and easy access. The one on one counseling, along with a client being on an individualized program is the reason our clients’ have a high success rate and this accelerate weight loss plan is designed specifically for them. We want all of our clients to be Living The Slim Life. If you live in the Northwood shopping center area, drop by or call for a free consultation. 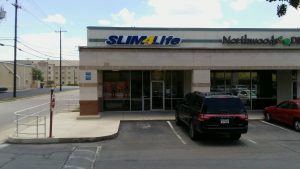 Make an appointment at our San Antonio – Northwoods weight loss center today!